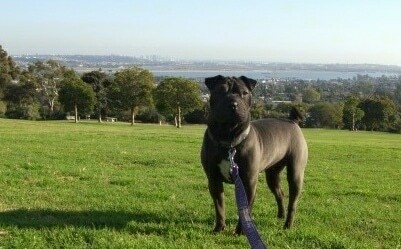 "This is Coda Blue, an Ori Pei at 7 months old. Coda learned her commands incredibly quickly, yet can still be stubborn when asked to perform them. Until recently, she was inexhaustible and insatiable (we've never seen an animal so eager to eat everything—tomatoes (right off the vine), lettuce, carrots, yarn, mice the cat caught, etc.) and after we get back from 20 minute runs she continues to run nonstop around the backyard for another 35 minutes. Coda is humorously intelligent, very active when outdoors, mellow once exercised, adaptable, an early riser, friendly to all strangers and nearly all dogs, and absolutely hilarious." "This is Coda, at 1 year, in the park. She is 23 pounds of muscle and personality, always running and trying to play with other dogs. She much prefers canine attention to human attention, when given the choice. In the absence of other dogs, she can't stay away from her humans for more than 3 minutes." 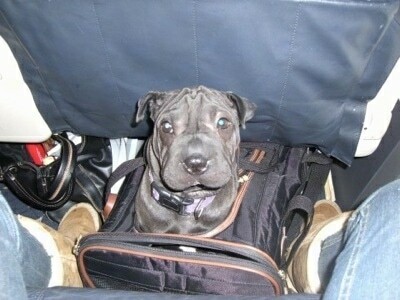 "This is one-year-old Coda, an Ori Pei on a plane for the 7th time. She is not fond of going into her case, but she always loves being with us at the final destination and the attention she gets en route. She has become quite the well-traveled dog." 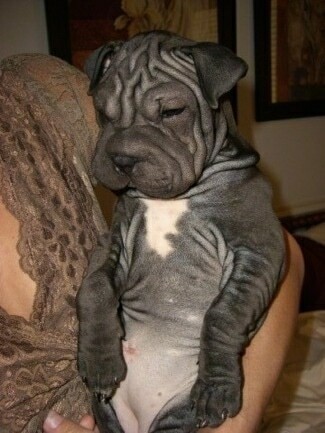 "This is my Ori-Pei pup, Wendell. He is registered. His father was a champion Shar-Pei and his mother a champion Pug. His registered name is Wendell E. Woo. He is an absolute blessing. He is an extremely goofy dog—he always seems to know when we need cheering up! He is super affectionate and LOVES to play. We enjoy long walks (and long cuddles/naps, too!). When he was a pup he would climb on our chest/shoulders and nuzzle our necks—he thinks he is still that small and will still climb on us at almost 30 pounds now. We have both cats and dogs in our home and he gets along with everyone. He never meets a stranger and gets rather offended if a passerby doesn't stop to tell him hello! He can be a little hard headed at times. He is a good sport, though—letting his mommies dress him up and not putting up a fight." Sage the female Ori-Pei female puppy (middle) with her parents Emily and Harrison (Harry for short)—Sage is 5 months old and her parents are both 2 years old. Her mother (left) is a flowered Ori Pei, where Sage and her father Harry (right) are fawn Ori Peis.